Initiative 1491, a gun-safety ballot measure, scored a big win thanks to broad support across state. 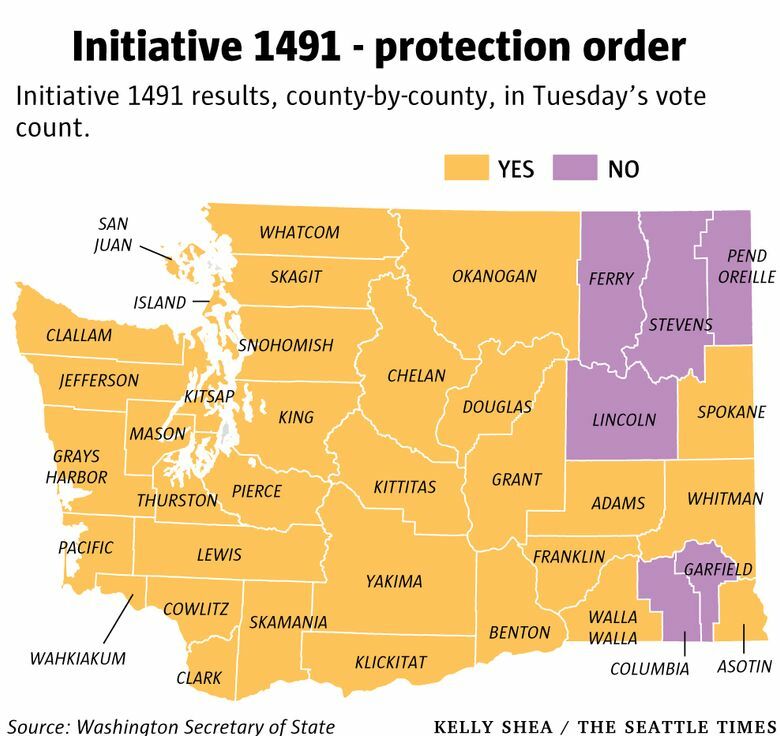 With broad support across both sides of the Cascade Mountains, Initiative 1491, a gun-safety ballot measure, won easily. In Tuesday night’s results, 71 percent of Washington voters were approving the initiative. In King County, 83 percent of voters were approving the measure, according to an update overnight that added a smaller batch of votes to the tally. I-1491 also led in Kitsap, Mason, Thurston, Snohomish and Pierce counties, as well as Spokane and Okanogan counties. Only a handful of Eastern Washington counties were rejecting the measure. Known as the extreme risk protection order, I-1491 sets up a process to allow law-enforcement officers, family members and others to ask a judge to keep firearms out of the hands of someone deemed a danger to themselves or others. The victory came after voters in 2014 approved an initiative expanding gun-purchase background checks in a hard-fought campaign between the Alliance for Gun Responsibility and gun-rights advocates. This year, however, the I-1491 campaign faced little organized opposition and had the benefit of having many of the same financial backers as 2014. The Alliance for Gun Responsibility raised more than $4 million. Much of that came from large donations by venture capitalist Nick Hanauer, Microsoft co-founder and philanthropist Paul Allen and former Microsoft CEO and current Los Angeles Clippers owner Steve Ballmer. Everytown for Gun Safety, the advocacy group created by former New York City Mayor Michael Bloomberg, also contributed more than $500,000. Washington is one of four states with gun-safety proposals on the ballot. Voters in Maine and Nevada are voting on measures that would expand gun-purchase background checks. Voters in California will decide on a ballot measure that, among other things, would prohibit large-capacity magazines and require a background check to buy ammunition.